On Tuesday September 4, three members of the Scottish Chamber Orchestra (SCO), including Alison Mitchell on principal flute and Felix Tanner on viola, came to Tarbert Academy for a day of composition. The day was for senior pupils studying Higher and Advanced Higher Music, with were senior pupils from Lochgilphead and Islay joining. The theme was American Minimalism, with the introductory session demonstrating and participating in its techniques. 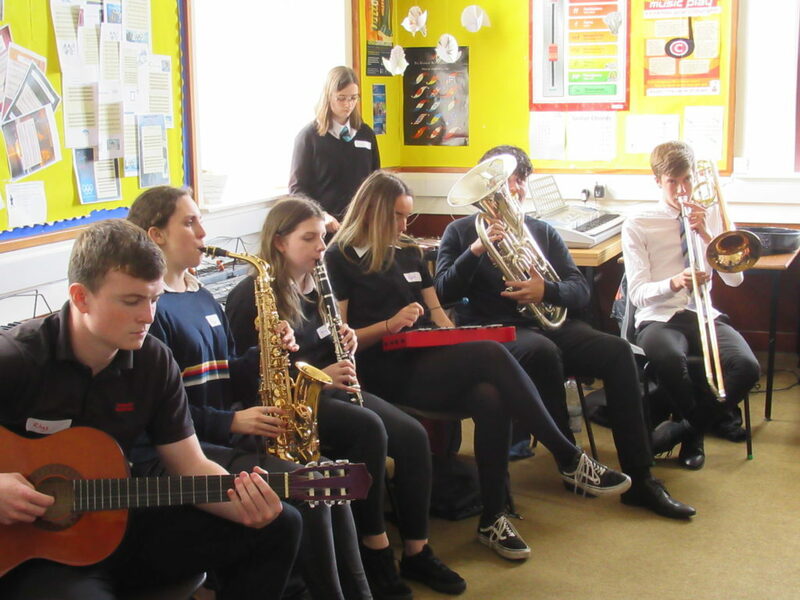 As pupils had brought a variety of instruments, including saxophones, flutes, guitars, accordion, trombone and, of course, tuned percussion, they were surprised that the day started with just rhythmic clapping. Alison and Felix both demonstrated playing techniques on their specialist instruments. For Alison, with a few flautists in the group, this was very informative. Scary soundtracks with special string techniques was Felix’s forte. We were split into two groups with each group composing three short melodies in the style of Steve Reich. These were developed using minimalist techniques such as addition, subtraction, stretching, interlocking, shifting and phasing with each melody sounding very different depending on the instruments within the group. We performed and gave positive feedback on each other’s work. After lunch we got together to compose a third section in the style of John Adams with input from everybody. Techniques used here included gradual transformation and even sparkles. By the end of the day we were able to put our melodies together and we performed our unnamed minimalist composition. The event involved us interacting with each other, meeting new people and learning interesting skills that will be beneficial for our exam next year. We are all thoroughly delighted to have been a part of what was a great experience. We are now looking forward to the SCO American Minimalism concert in Helensburgh on Wednesday September 19.